yesterday i had a wonderful conversation with dr. matthew b. james about the hawaiian spiritual system of huna. since this is national mental health week and the focus of this year’s mental health week is workplace mental health, i asked him about huna in the workplace. first of all, what is huna? it appears that huna derives from an ancient art and science of healing and spiritual development. dr. james believes this ancient system to be as old as 35,000 years. it is said to be a part of the original teachings of the peoples of a place which no longer exists. what remains physically of that land are the mountain peaks of the island chain called hawaii. huna is a modern label for certain spiritual and/or energy practices in the islands prior to western influences. the term huna, i am learning, seems to be connected to something called ho’omana. ho’o means to make. mana means life force, equivalent, for example, to ki. “taken together,” says dr. james, “the word ho’omana means empowerment”. another important concept appears to be pono. literally, pono means “just beneath the surface”. it also means something like a wonderful form of righteousness: “standing in your own light, you are congruent with who you are”. the way i am starting to understand this is that ho’omana can be seen as the practice of empowerment – an action towards empowerment – whereas pono is the result of that action. “when a negative thing occurs, we put it put it in a black bag'”. this black bag absorbs energy – the light of pono – and then prevents a person’s energy from creating what they want. i was happy to hear that dr. james was quick to point out that there is no need to vilify, deny or suppress so-called negative energies. negative emotions are sometimes really good barometers. the trick is to acknowledge them, do whatever is necessary, and then let them go. problems only arise when we hold on to these “negative” emotions. when a person holds on to negative emotions, they are pushed out of balance. in ancient hawaiian terms, nothing can be done well unless all three parts of a person, the unihipili, uhane, and aumakua (roughly translated, the subconscious, the conscious, and the superconscious) are in alignment. and if you hold on to anger for an extended period, it’s bad for your body. someone who is pono (stands in the light, is empowered) does not hold on to anger. how does that play out in the workplace? first, if you truly dislike your job, quit it. you can’t survive on sitting around thinking happy thoughts all the time. being spiritual doesn’t throw out intelligent thinking. if something is harmful and you keep allowing it to happen, you don’t stand in the light. and if the workplace is not horrible but has some problems? we don’t make positive decisions when we stand in the negative. try to forgive the person and forgive yourself. this is part of the practice of ho’oponopono, which means literally (or as literally as any translation of hawaiian concepts can get) “to make things right”. it is also often translated as forgiveness. in ancient hawaii there was no word for sorry. “‘i’m sorry’ is blunt, and it ends the conversation. 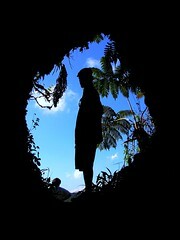 it encourages no interaction.” in hawaiian, one would say, “i humbly ask for your forgiveness. i forgive you, too.” this encourages interaction, and turns the exchange into a give and take: you receive, you give. energy or mana flows like an alternating current. we have to make a complete circuit. language follows energy; it acts like energy. once you change your language, your thinking changes. george naope, a hawaiian elder and master of chanting and hula, says, “think not that all wisdom is in your school”. often we think we know everything but all we know is how it works for us at this moment, not for someone else. george naope says, “i know you are masters, as well, and i respect that. this just happens to be the way i do it.” if you can’t recognize that, you set yourself up for confrontation. realize the other person may be there to teach you just as much as you want to teach them (or simply tell them what to do or think!). dr. james has a masters in organizational management and does a lot of teaching in that area. the best way to manage is through team building. this closely mirrors ancient approaches to teaching. teachers/managers are not there to tell you what to do, they are there to increase the chance for success of the people they are managing through support, effective delegation and inspiration. most successful companies give their employees a lot of responsibilities. good managers cultivate their employees’ pono – standing in their on light, accountable, empowered, productive. by empowering others they empower themselves and the organization. huna teaches that if you give someone responsibility, you have to give it to them 100%. you have to let them go through their learning curve. if something comes up, you just express it. and then together you come to a solution. however, first you must let the other person fully express what went wrong and not say anything until they have completely expressed themselves. This entry was posted in communication, emotional health, spirituality and tagged forgiveness, hawaii, huna, mental health, work on May 8, 2008 by isabella mori. Wonderful primer on the ancient art of Huna. when a negative thing occurs, we put it put it in a black bagâ€™â€. this black bag absorbs energy â€“ the light of pono â€“ and then prevents a personâ€™s energy from creating what they want.